Home » News & Events » News » CHARITY WALKERS RAISE FUNDS FOR BLUEBELL WOOD HOSPICE AND CANCER RESEARCH UK, TEENS AND KIDS! CHARITY WALKERS RAISE FUNDS FOR BLUEBELL WOOD HOSPICE AND CANCER RESEARCH UK, TEENS AND KIDS! In what is becoming an annual event, a number of Stelrad employees and ex-employees recently completed an impressive charity walk along the Northumberland Coastal Path from Beadnall to Berwick-upon-Tweed, in aid of the Bluebell Wood Hospice in South Yorkshire and Cancer Research UK Teens and Kids. 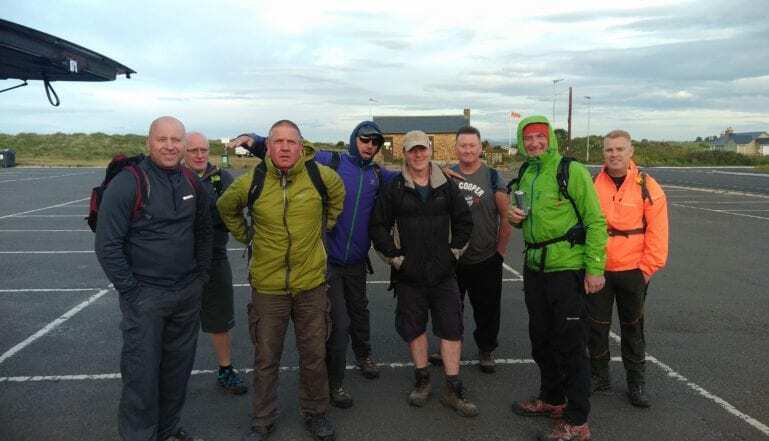 The walk was 34 miles long and took the group from 5.30am right through until 6.30pm with only refreshment and food breaks en route – so a stiff walk for eleven and a half hours – initially in good weather but belatedly in rain including thunder and lightning around lunchtime! The group – Steve Stead, Chris Fisher, Vaughan Calladine, Dave Wessell, Lee Kerry, Rob Bremington, Ricky Howlett and Guy Outram – raised £1,363 with the kind support of family, friends, colleagues and even the locals at the pub they stopped at for lunch on the way north. That amount will now be doubled by the company – making the total donation to the two charities in excess of £2,700.